Supplier & manufacturer of PCA Upgradable Syringe Pumps. 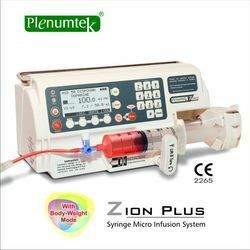 Our product range also comprises of Syringe Pump Zeta, Syringe Pump Zion and Syringe Pump Zion Plus. 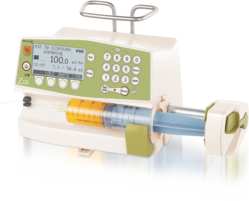 The Plenum's PCA Upgradable Syringe Pumps are designed to infuse the drug to the patient and are proven mechanism for effective drug delivery for pain management. Each machine is accomplished with microprocessor control of flow rate, time, volume & dose, activates alarm automatically if the infusion rate cannot be maintained or the solution runs out- all provided by a motor - driven mechanism. We are one of the leading syringe pump manufacturer in India. KVO/KOR: Seattable from 0.1 to 5 ml/hr Provision to keep it Off. Dimensions 135 (H) x 272 (W) x 150 (D) mm / Weight 2.3 Kgs./ Housing ABS Plastic. Power Source Battery 110/220 Vac (+/-10%),50/60hz,12 Va,External Power 12 Vdc By A Converter. INFUSION MODES: 1] ml/h (0.1 ml/h increments), 2] Volume limit: 0.1-999.9 ml (0.1 ml increments), 3] Volume / time: 0.1-999.9 ml; 00h01- 100h00., 4] Dose rate., # Dose units: mcg, mcg/min, mcg/hr, mcg/kg/min, mcg/kg/hr,mg, mg/min, mg/hr, mg/kg/min, mg/kg/hr, U, kU, # Dilution setting: X mg/ml or X mg / Y ml. INFUSION MODES: 1] ml/h (0.1 ml/h increments), 2] Volume limit: 0.1-999.9 ml (0.1 ml increments), 3] Volume / time: 0.1-999.9 ml; 00h01- 100h00., 4] Dose rate., # Dose units: mcg, mcg/min, mcg/hr, mcg/kg/min, mcg/kg/hr,mg, mg/min, mg/hr, mg/kg/min, mg/kg/hr, # Dilution setting: X mg/ml or X mg / Y ml. END OF INFUSION: (V/T & VL) KVO 1 and KVO 2: from 0.1 to 5 ml/h adjustable and storable, continuous infusion or stop. PUMP STATUS: Red for AC power status and Green for infusion in progress. Idle/ Non operative time over. Visibility up to 5 meters. All alarms are expressed by means of flashing messages on LCD, graphics and sound beep. SYRINGE POSITION CONTROL: Syringe barrel knob check, Plunger head detection, Anti-siphon system check. DEVICE CONTROL: Disengaged driving mechanism alarm, Low battery pre-alarm, Discharged battery alarm, Unconfirmed programming, Technical malfunction alarm, Drive system advance check, Watchdog check. INFUSION CONTROL: Occlusion pressure alarm, End of infusion pre-alarm, End of infusion alarm, Syringe empty, KVO, Volume limit pre-alarm, Volume limit alarm, keypad locking. POWER SOURCE: 110/220 VAC (+/-10%), Freq: 50/60Hz, 12 VA, External power 12 VDC by a converter. DIMENSIONS: 135 (H) x 272 (W) x 150 (D) mm / Weight: 2.3 Kgs./ Housing: ABS Plastic. STACKABILITY: Electrical: AC Power cord with multiple inputs to connect max 8 devices on single power socket. Looking for PCA Upgradable Pump ?